I love healing stones and earth medicine, so immediately this book’s title made me want to read it. 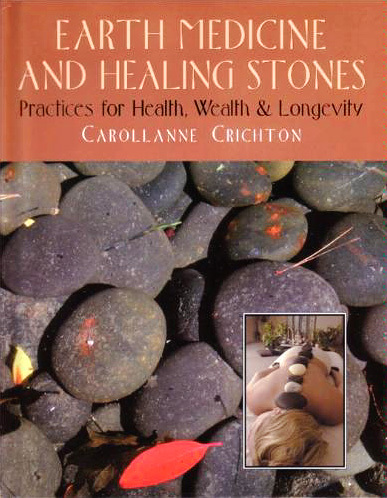 Within this book’s fascinating pages, Crichton details the history of earth medicine, introduces readers to basic meditation, and delves into stone massage methods, accompanied by colourful pictures of stones and natural scenes. The book is enjoyable and informative, though it could be made better in some ways. Crichton attempts to make the book an all-encompassing anthology of earth medicine, meditation, earth-affirming myths, and stone massage techniques, but this results in a book that reads in a choppy and scattered manner. Especially since her chapters on stone massage are towards the end of the book, yet play a large role in the book’s title, I was confused by the bulk of material in the beginning — such as “Tapping into Your Inner Vein of Gold” and “Sacred Sites and Holy Lands” — that seem unrelated to stone massage in and of itself. But it is worth noting that Crichton presents the information in each chapter neatly and eloquently, making the chapters themselves engaging reads. Crichton pulls science into her chapters, using examples from studies or other scientific research to support her ideas and proposals; however, I would have preferred if science had been left out of this book. Though science, healing, and earth medicine are intimately linked, I think it would be nicer to have a book that presents only the spiritual side of earth medicine/stone massage, as opposed to trying to tack stuffy scientific papers onto an otherwise relaxing experience. On a more positive note, the meditations Crichton presents in her book are helpful and easy to practice. She presents them in a simple-to-follow format that instructs while not being preachy; and when I tried them I felt much better and much more relaxed afterwards. I especially enjoyed the Stone Meditation and Rock Walking, in which you utilise stones in a creative manner to encourage yourself to relax and focus on your dreams. Crichton also presents readers with a Life Balance Program, which is designed to balance and refocus your life so you live more peacefully and healthfully. Over the assigned four weeks, I tried her program — it entails sleeping in and eating lots of tasty fruits and vegetables — and it does work! I have more energy than I did before, and I feel overall revitalised and awakened. Overall, I would still recommend this book to others; though I would advise them to stick only to chapters that pertain to their needs and interests. I do feel more enlightened about the ground beneath my feet and definitely will consider having a stone massage the next time I feel ill. This book would read better if it were split up into several individual books — one specifically on earth medicine, another on healing stones and stone massage, and a third on earth-medicine/mind-body meditation. Crichton’s voice is comfortably confident in each arena, so I’d love to see her focus her knowledge into easy-to-read, straightforward books. I know I’d certainly read them then.